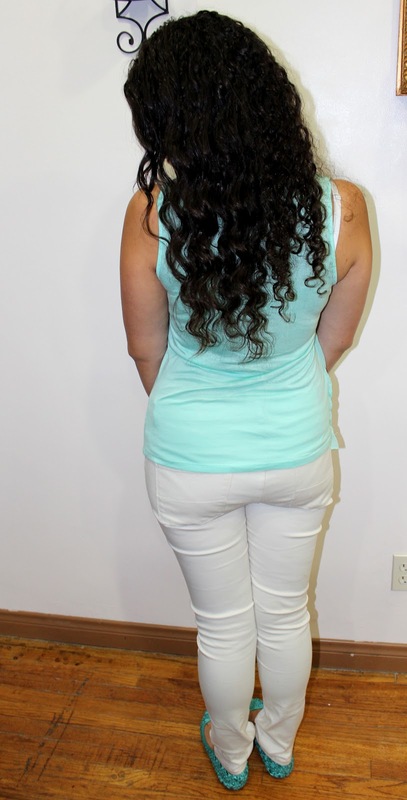 Today's outfit is all about mint, a color I have been absolutely loving this summer! 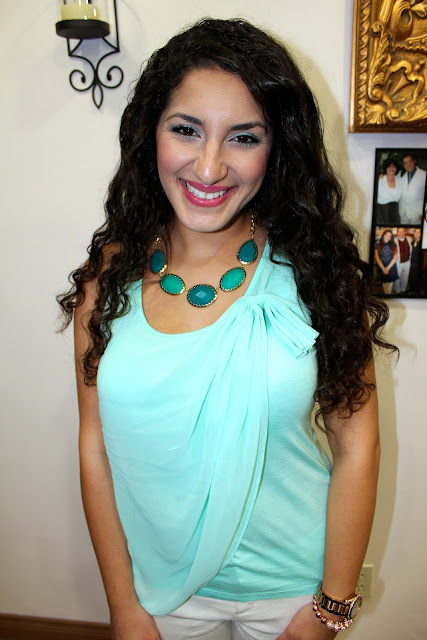 I found this amazing toga-style mint blouse at Forever 21 recently. It is a sleeveless blouse that features a fan-like bow detail with chiffon fabric draping down the shoulder. I paired it with cream-colored skinny jeans, also from Forever 21, and a light, taupe cardigan from Love Culture. I thought the cream jeans really worked to make the mint stand-out in this outfit, but also kept it light and airy. As to not overload with the color matching, I added a taupe cardigan to balance the outfit when it got a little chilly in the evening. 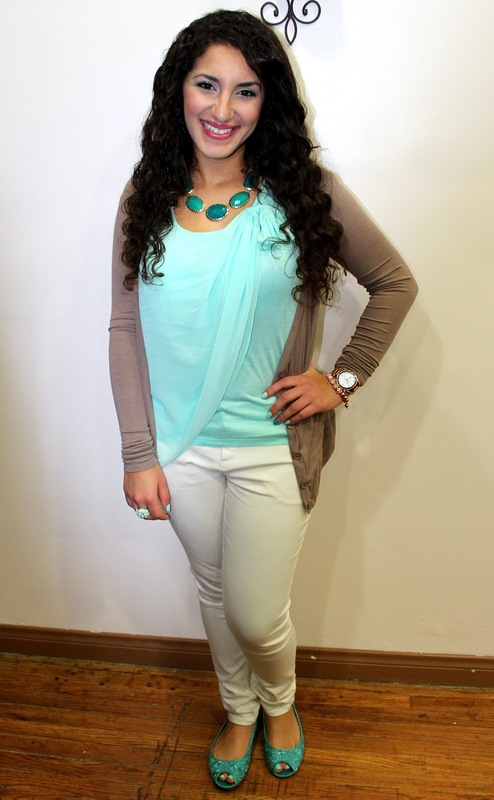 The neutral color toned down the bright color, but still kept the attention on the mint. For accessories, I am wearing my usual rose gold Michael Kors watch and rose gold wrap bracelet from Bauble Bar in addition to a mint encrusted ring from For Love 21 and my blue-gemmed necklace from So Good jewelry store in San Diego. For earrings I am wearing the lovely Forever Audrey earrings from Jewelmint. The aqua peep-toe flats are from H&M and are really comfortable! For makeup, I decided to go all-out with an aqua eye and a brighter pink lip. Urban Decay (Naked palette): Virgin under brow and on inner corner, Sin on inner 1/3 of lid, and Naked in the crease.